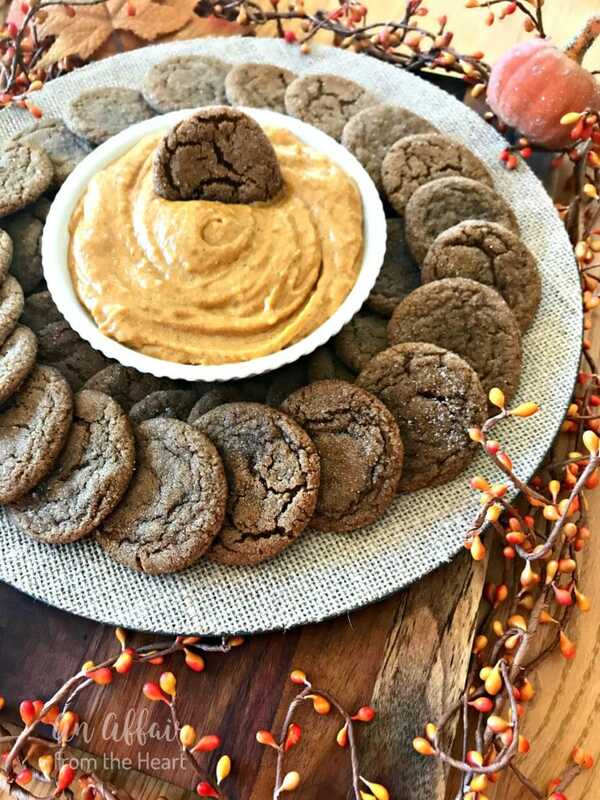 Soft and chewy spice cookies surround a bowl of pumpkin dip — perfect for fall entertaining. So many times when we think of dips, they are savory. 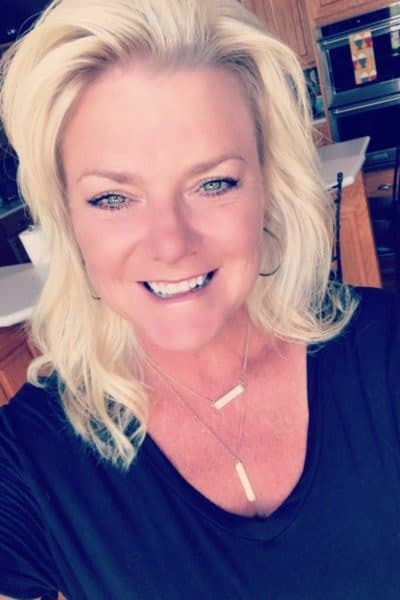 But what about those of us who love the sweet side of things? 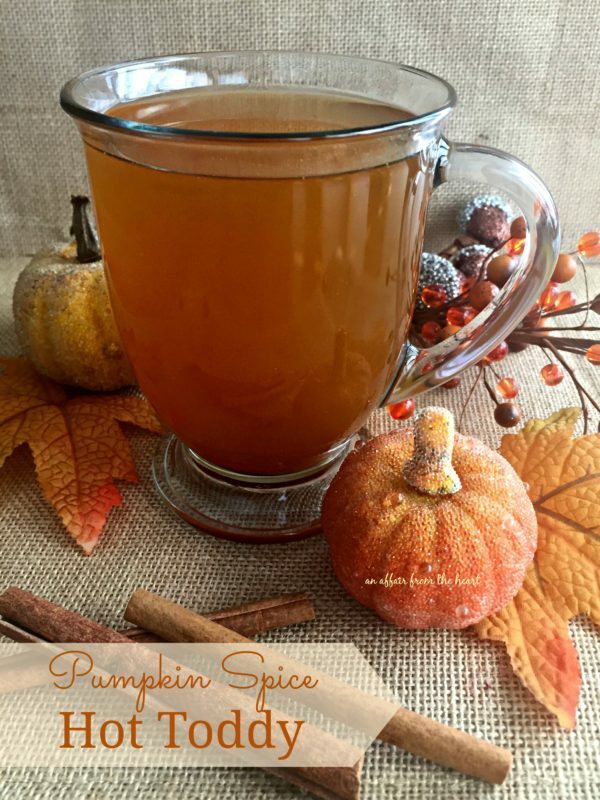 Especially this time of year, when the flavors lend themselves to cinnamon, and spice and everything PUMPKIN! 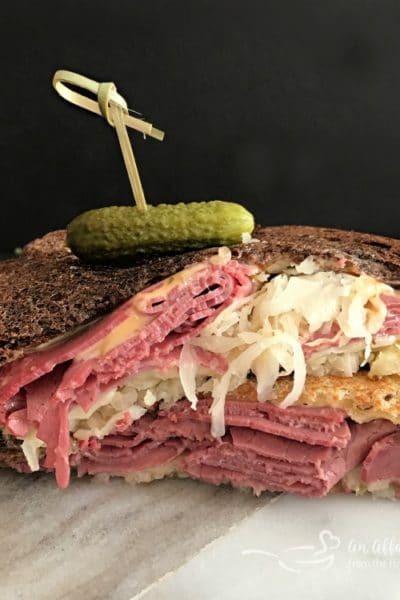 I have had this recipe for YEARS. I got it from an old friend of mine, and fell in love with it instantly. It came to mind instantly when I was trying to decide what recipes to make for #PumpkinWeek. 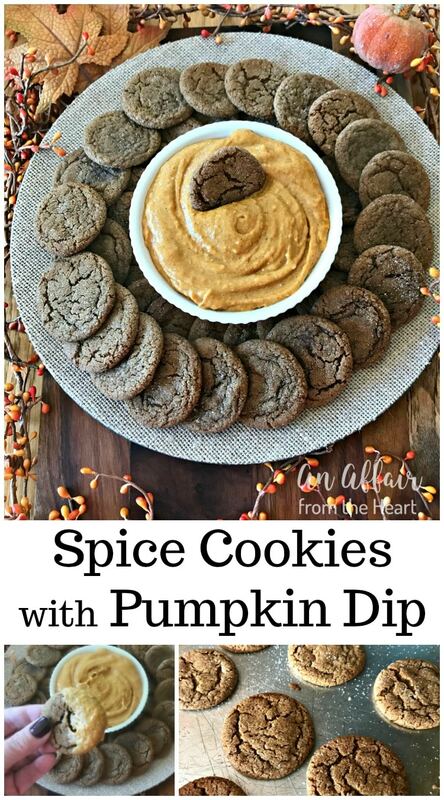 The cookies by themselves are HEAVENLY .. but add the pumpkin dip? You will be over the harvest moon! Wouldn’t these be pretty on your Thanksgiving table? 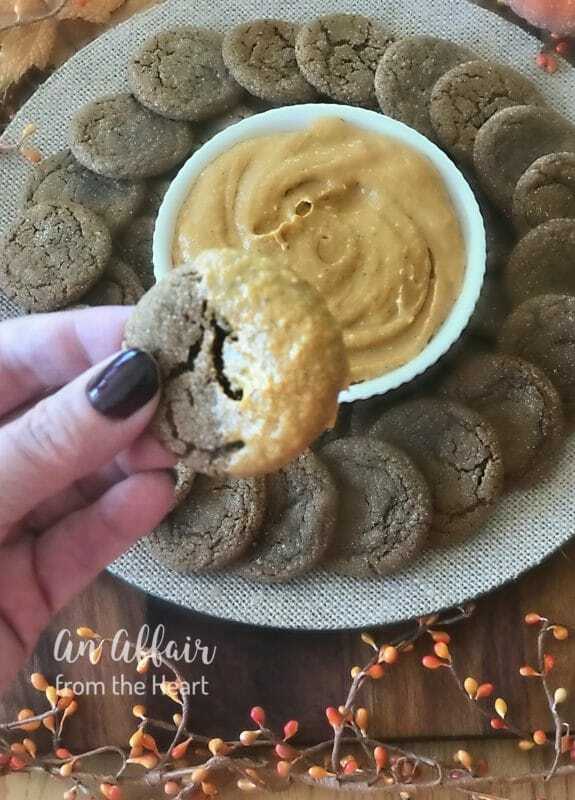 Who wouldn’t love to have a sweet little spice cookie, dunked in a pumpkin dip made of cream cheese, pumpkin, sugar and spices? Remember I told you about Pumpkin Week on Monday? I shared a Pumpkin zucchini Bread with Streusel Topping. Pumpkin week is organized by Terri of Love and Confections. All this week, from October 1- 5th, 2017, you can visit our blogs for nothing but pumpkin recipes. 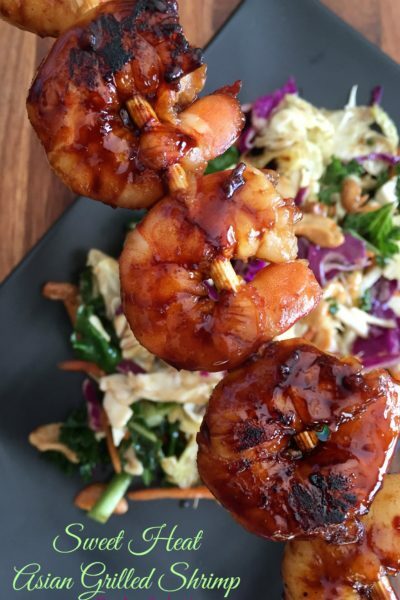 Sweet, Savory and even drinks! Want to keep up with all of the Pumpkin Goodness? Simply search the hashtag #PumpkinWeek to see everyones recipes! 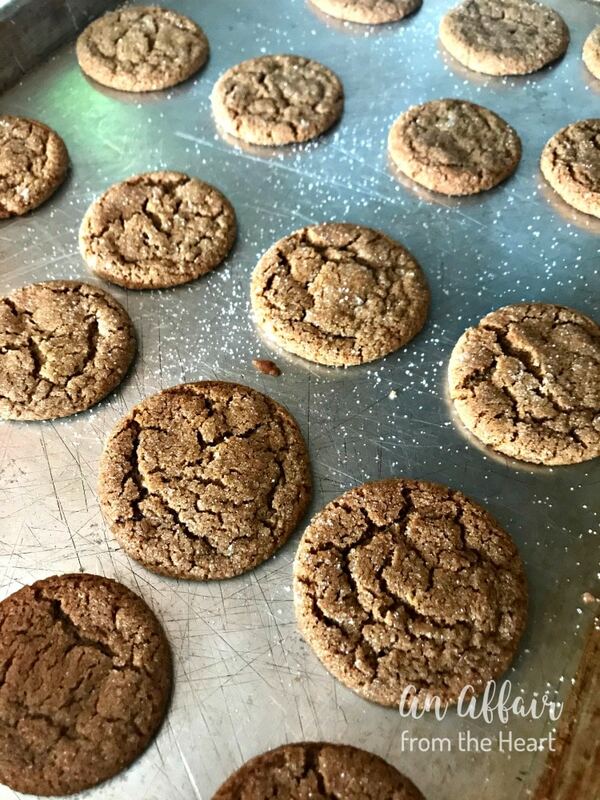 Do you like Gingersnaps? I have always loved them! Traditional gingersnaps are usually hard though, perfect for dunking in a warm cup of your favorite. Not that these wouldn’t be perfect dunked, but they are so soft, they are irresistible! Honestly — I made them to share them with you — and I spent the next couple of days gifting them, because I couldn’t leave them alone! I made these cookies a little larger than I normally make them. Typically I make them almost half this size. These are more of a traditional gingersnap size. I was able to bake up 6 dozen this way. They freeze really well, too. If you don’t believe me just how good these are … let’s ask my official cookie tester! This is my sweet little Great-Nephew, Hunter. He came over last weekend to work on a project with his Mommy and I. 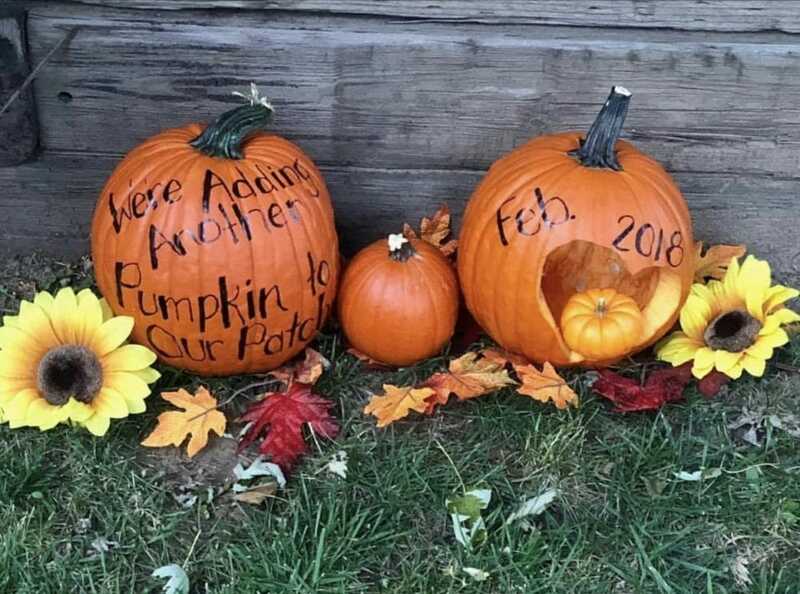 She wanted to come up with a clever way to announce that Hunter was going to be a big brother! They brought over some pumpkins and we got to work. 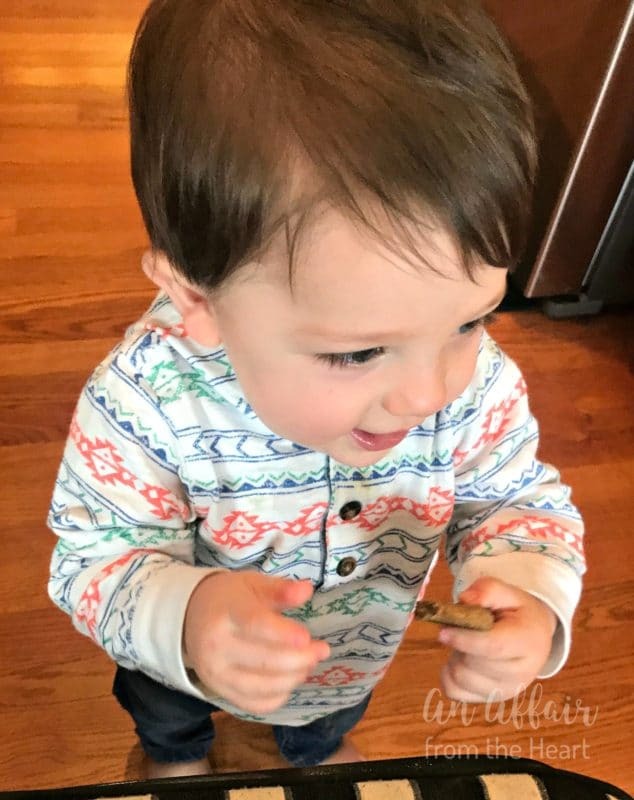 Hunter knows that Aunt Michaela always has something nummy at her house, and he tried the spice cookies. I knew from his use of the word “more” that they were a hit. That and that heart melting smile of his! I think their announcement turned out pretty cute! Who’s ready to get dunking?? 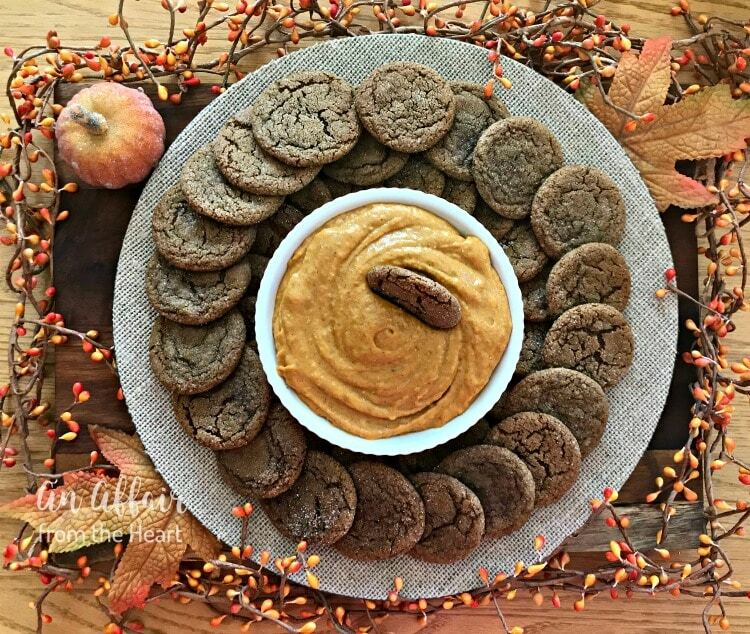 Soft and chewy spice cookies surround a bowl of pumpkin dip -- perfect for fall entertaining. To make the cookies: Cream butter and sugar then add eggs one at a time, beating well after each one. Add molasses, mix well. 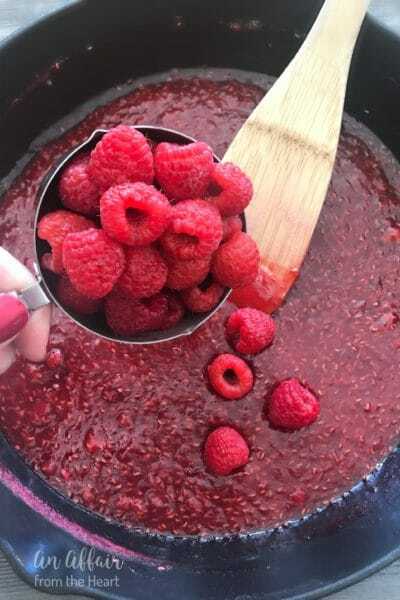 Combine dry ingredients and add to creamed mixture, mix well and chill overnight. Shape into ½ inch balls and roll in sugar, place 2′ apart on an ungreased baking sheet. Bake at 350 degrees for 6 minutes or until edges begin to brown. Do Not over bake, or they won’t be chewy. Cool 2 minutes before removing to cooling rack. 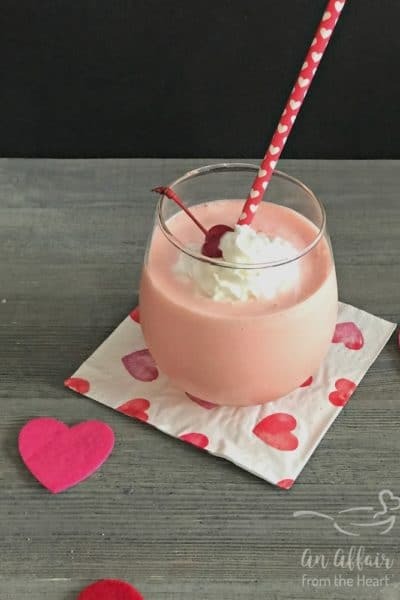 To make the dip: , cream the cream cheese with a mixer until smooth. 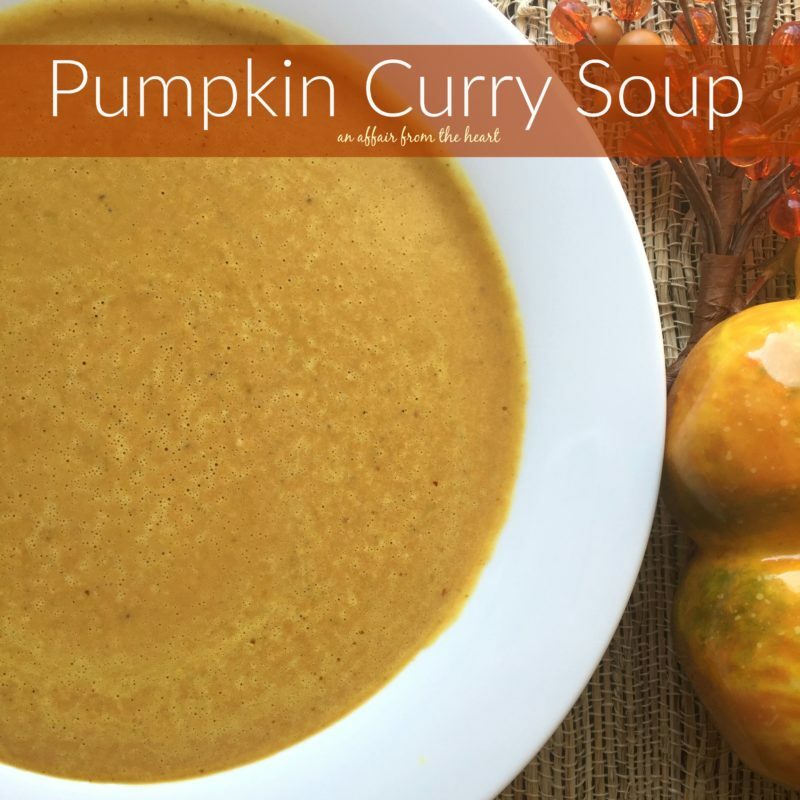 Add pumpkin and beat well. 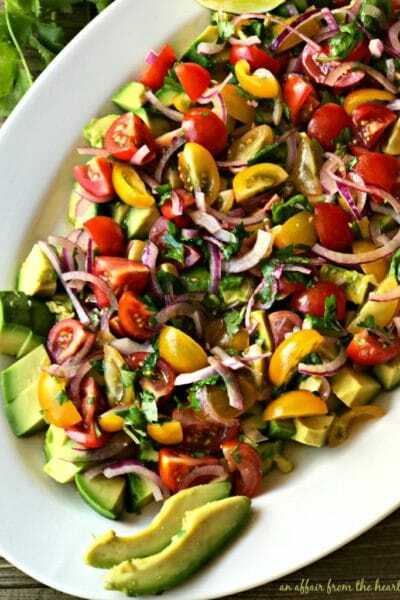 Add dry ingredients and beat until smooth. 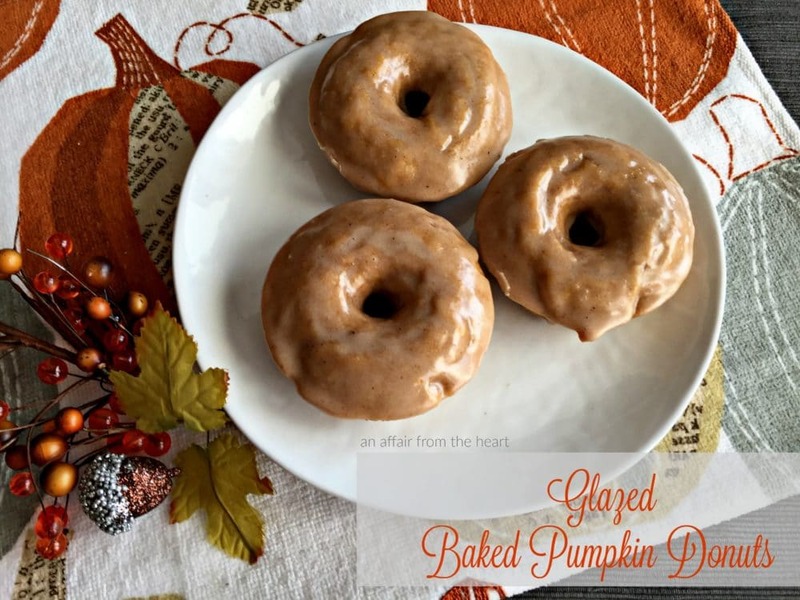 I have quite a few pumpkin recipes on my blog — Here are a couple of our favorites! I have a Harvest Dinner at our church for which I need to bring a dessert. This is perfect. 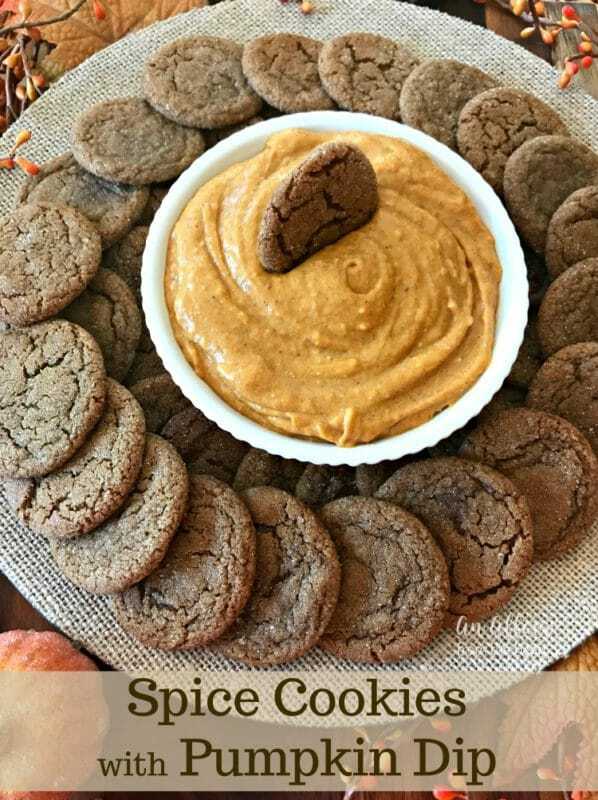 I love a good spice cookie, and the idea of being able to dip that cookie in pumpkin dip just has me doing cartwheels! Yummy! From September to January I am serving these! !